I would still save them. Please go to the Doodle 4 Google Regional Finalist page and vote for REGION 6. My digital media class had a visit from a local former student, Sean Hunt. Sean just graduated from Webster University with a degree in film production. Here is a link to his website. Sean deconstructed a few scenes from his last feature length film Platinum and answered questions from the students. He also met up with my former and future student Parker (above left) who makes movies to put on Youtube. Before he met with my class I grilled him for an hour about making movies and he politely answered all my questions. I truly find the process of movie making fascinating and I understand that I would in no way be able to make them. We talked about telling stories, what his future plans are, and which directors inspire him (Spielberg and Lucas). Sean is working on a new movie called Swing Set. He plans on having it ready for a Christmas vacation viewing. It was a real pleasure talking to Sean. 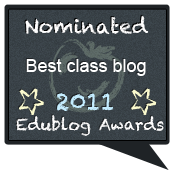 The class blog has been given this blogging award by three different teachers. The first is Mr. Webb from http://melvilleroom8.blogspot.com/ As any reader of my blog knows I have the utmost respect for Mr. Webb and his use of blogging in the classroom. His emphasis on student created video is inspiring and he is a valuable member of my personal learning network. The second class blog that gave us the award is Super 7 Scoopers @ St. Clair. Ms. Bee's has become part of my extended personal learning network. Although she has had ties to several class blogs that I follow in New Zealand, I know her best from my class leaving Comments4Kids. The Scoopers blog is another amazing blog from New Zealand. The third class blog that gave us the award is Bailey Road Team 17. Mr. Wood has become a real Comments4Kids warrior. When I see a link to comment on more often than not Mr. Wood has already left a great comment on it. To top it all off, he also has an amazing class blog! If you are not familiar with NZ's schools quality of blogging, I suggest you visit these three great examples. 1. Copy and display the picture of the award. 3. Nominate 10 new blogs. 4. Inform the people who's blog you nominated so they can continue to spread the word about the other great blogs out there. As usual I am going to do things a little differently. The blogs I choose are important to me for a variety of reasons. They may not be the 10 best blogs of all time, but they all have qualities that I appreciate. Please enjoy! Daraja Academy-Official Blog I admit that I am not brave enough to quit my job and move to Africa to build a school. That is why this blog is so important to me. While I complain about computers not working, the staff at Daraja is finding solutions to their school's lack of drinking water. At the Fireplace Mrs. Tarasevich's blog really interests me. She teaches in Russia and fills her blog with great information about her school. I really enjoy learning about education in other countries and her blog is a joy to read! Fairview Physical Education Mr. Beringer probably doesn't even know who I am, but I am a big fan of his blog. I rarely find physical education blogs but if I were to give only one blog as an example it would be this one. Mr. Beringer fills it with explanations of what his students are doing and great pictures of them doing it. A real find! Flattening the World Mrs. Pohanka's blog focuses on geography, but she accomplishes so much more with her students. Not satisfied with teaching facts about the countries her students study, she gets them to think about the problems and issues those countries face. This is how technology can truly transform a curriculum. Little Voices, Little Scholars Mrs. She works with young children's literacy. She uses audio, video, and web tools to help her students learn how to read and write. If you teach very young children you can learn a lot about literacy from Mrs. She and her class. Mr. Lamshed's Class Mr. Lamshed personifies making a class a family. He teaches an all boys class and has created an amazing atmosphere. Through Mr. Lamshed's hard work his students get opportunities that otherwise they would never experience. If I was making an all star teaching squad, Mr. Lamshed would definitely be on the team. Mr. McClung's World Mr. McClung is a former colleague of mine. Two years ago he showed up for his first year of teaching and promptly jumped into class blogging. His progress has astounded me. He makes me feel like a Sith Lord uneasily waiting to be challenged by his brilliant apprentice. Mr. McClung does two things with his blog that are amazing. First he posts almost daily (which can be unbelievabley hard) excellent posts on what his students are learning. Second he reflects weekly about what he has learned. This is a wonderful example which I plan to emulate next year with my students. 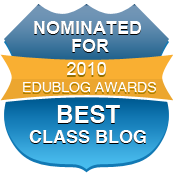 My last two blogs are not class blogs. (I told you I do things differently!) These two blogs are by young ladies that attend the Shanghai American School in China. Tiffany and Rachel are probably the ones most responsible for my drive for commenting on blogs. They noticed my blog a few years ago when I was not getting any comments (especially from oversees.) Not only did we trade comments, but we often communicated through Google chat (even during school when they were supposed to be working :). The interactions I had with them showed me that connections can be made through blogging. Unfortunately because Blogger is blocked by China they no longer can leave comments on my blog. This too is a bitter lesson I have had to learn. Life Long Learner Rachel's blog. More and more classrooms are using Kidblog.org. Not only has it been adopted quickly, but because it aggregates students posts into one page it makes it very easy to see the posts and comment on them. Today we are going to comment on four different class blogs. 3) Comment only when you have something to say. BRS Room 17 Mr. Wood has been a great supporter of Comments4Kids and I often see him leaving comments on many class and student blogs. It is time to repay the favor. CLG Enrichment is a blog created by Mrs. Guest. Her students have written about the movie Avatar. 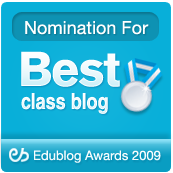 Read her post here and then leave a comment on a student blog using the guidelines from Mrs. Guest's post. Grade 6 Computers is a class blog from Japan. The class teacher is Ms. President. This is a first since I haven't found a class blog in Japan before! Mrs. Kolbert's Class is a blog we have visited before. 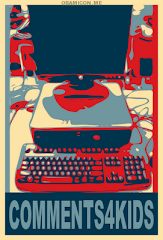 You may want to revisit a particular student's post or you may want to choose a new student to write a comment on. Mrs. Dyke's Class is a blog we visited last week. The students are writing first person narratives about World War II. This is the first time I have done back to back weeks with one class blog. Make your comments good!